All you need to make cleaning pool filters a breeze. 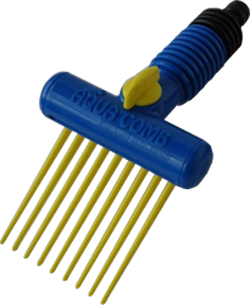 “Pool Aqua Comb” – Specifically designed for deep pleated pool cartridge filters! Wash your pool cartridge filter faster (3-5 min.) and cleaner (like new water flow rate means less resistance), lowering your home utility bill! How does a Pool Aqua Comb work? 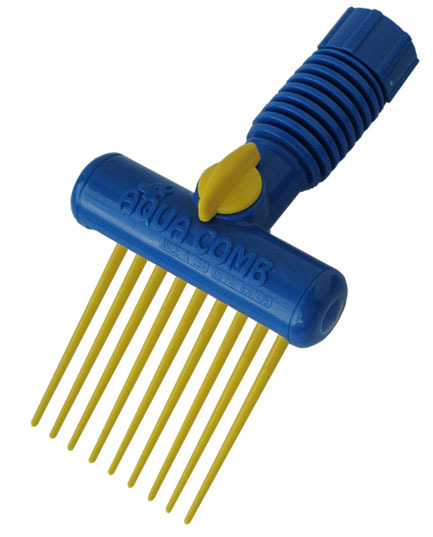 The Aqua Comb combines a flat 3″ wide spray that acts like a wall with a long fingered pic-comb that both opens the deep pleats for the spray to reach in and allow the combs to scrub the pleat walls and dig out the bugs, vegetation and other debris that accumulates. Retailers – Order Your Pool Aqua Combs Today. Removes dog hair, bugs, leaves etc. Removes dust from Desert storms and marcite repairs. No more tossing out perfectly good filters! 3) Attractive colors and designed for ease of use . 6) Used by pool services and homeowners. The Aqua Comb is easy to use and will save you both time and money when you more thoroughly clean your pool filter. You will no longer dread this chore! Pool Builders are rapidly moving into cartridge filtration systems and Pool Aqua Combs make cartridge filter cleaning fast and easy. The sand and DE filtration systems are the leaded gas of the pool industry. Both waste 200-400 gallons of highly chemical laden water which pollutes the environment and the DE soil is an extreme health hazard to the homeowner, their children and pets if they spread the waste in their gardens or breath the DE dust when recharging system. Many states, counties and cities are banning new DE and sand filtration system installations. Conversions to cartridge are relatively inexpensive, easy to install and Mother Earth will benefit! Aqua Combs make cleaning cartridge filters a breeze. Interested in the Pool Aqua Comb?